Who doesn’t love a comforting bowl of chili? ESPECIALLY when it’s made with EXTRA-LEAN ingredients! Chili is one of my favourite go to “comfort foods” in the Fall and Winter months, because it tastes lean-mazing and is packed with so many great nutrients! This cauliflower chili recipe is full of flavour, packed with nutrients, and is so easy to make that it will quickly become a Winter favourite. Eating “warming” foods like soups, stews, and chilis are not only comforting, but they are easier on the digestive system (especially in the colder months) which also helps keeps the body burning! 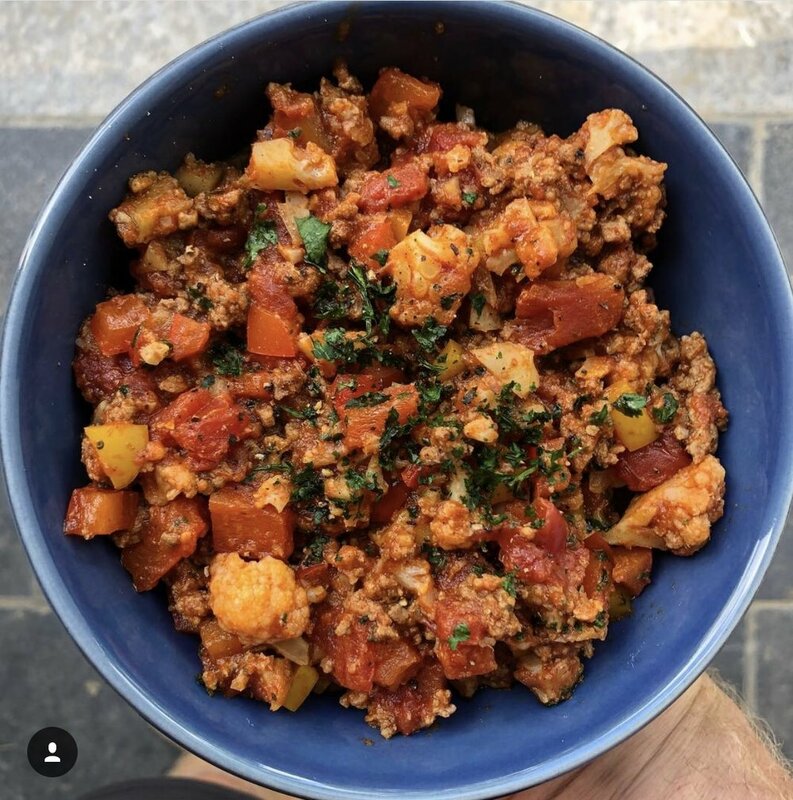 This cauliflower beef chili is a twist on traditional chili recipes, because the cauliflower and beef make it very hearty and filling, while keeping it super lean! Cauliflower is one of my favourite lean-staples -- not only is it low in calories (perfect for a lean meal), but it’s full of vitamins, minerals and fiber! On top of all of the vitamins, minerals and fiber, ground beef is loaded with protein which helps balance blood sugar levels (the key to leanness) and will keep you feeling “full” for longer! Oh ya, AND if you are feeling BOLD the chili powder will add some extra heat, which REALLY revs up the metabolism!! - A Dollop of Greek yogurt (extra protein). Hudson wants to make sure you follow these Lean-structions! In a large soup pot, heat the olive oil over medium-high heat and sauté the ground beef for 8-10 minutes until lightly browned. Add rest of ingredients (except cilantro) and cook until chili reaches desired consistency (about 8-10 minutes). Serve with fresh chopped cilantro and/or toppings of your choice and enjoy! **For Lean-Prep: Place remaining chili in tupperware and store in fridge for 3-4 days!! Newer PostRed Pepper Nachos (Lean-chos)!! Older PostSUPER EASY IMMUNE BOOSTING CHICKEN SOUP!